The Lalgarh Palace was built under the personal supervision of Maharaja Ganga Singhji in 1902 AD, in fond memory of his father Maharaja Lall Singhji. It is an imposing red sandstone palace, displaying extravagant Rajput, European and Muslim styles of architecture. The Rajput exterior of the palace, dramatically contrasts the occidental décor inside the palace. 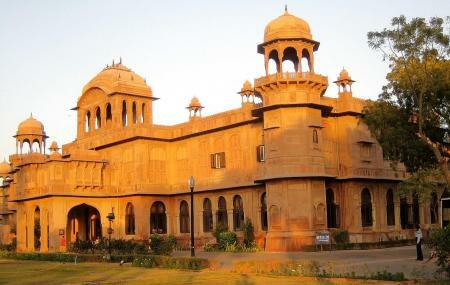 It is an unmatched jewel of the Thar Desert and a must visit when in Bikaner. How popular is Lalgarh Palace And Museum? People normally club together Sadul Singh Museum and Lalgarh Palace while planning their visit to Lalgarh Palace And Museum.